The movie will be centered on Haseena Parkar, Dawood Ibrahim's closest sister. The film will focus on the 40 year journey of Haseena, who died in 2014 having suffered a heart attack, depicting an emotional saga of a woman and what it meant to be the sister of underworld don Dawood Ibrahim. Wow, could this be our first shot at seeing her in an antiheroic role? Finally, a film of Sonakshi Sinha that gives her something more to do than just sing songs and have some random romantic scenes in the first half-hour of the movie! Lootera showed us what she can do as an actress - hopefully we'll get to see her in an unabashedly villainous role as the mafia lord. However, I cringe upon thinking of director Apoorva Lakhia's previous track record. Sonakshi walked out. This project might not happen. Some rumours suggest that Shraddha might replace Sonakshi and Sidhant (Shraddha's brother) might play Dawood. Sonakshi Sinha was supposed to play the role of Haseena Parker in Apoorva Lakhia's film, but the recent buzz is that Shraddha Kapoor has been finalised for the role. Sonakshi, who was earlier excited to do the film, opted out of it due to date issues. "Apu met Shraddha for the role and explained that Sonakshi had to opt out because of a dates issue. Shraddha who has so far done only romantic roles sees this as a chance to stretch herself as an actor and to prove her versatility," DNA quoted a source as saying. 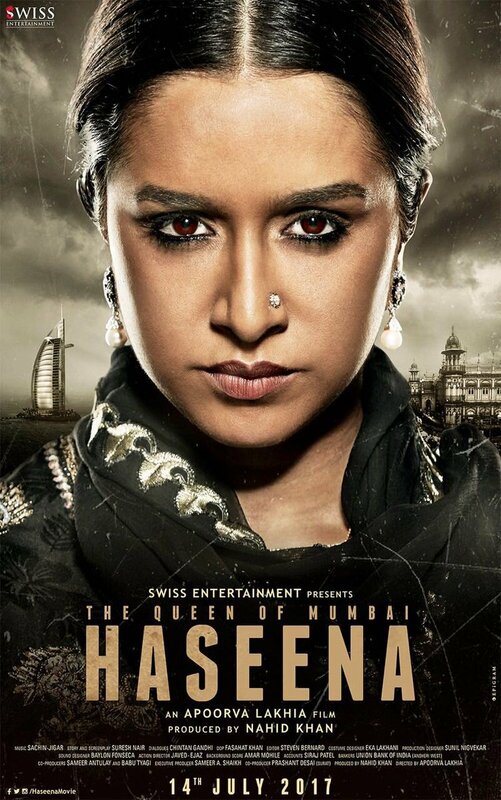 The film "Haseena" is based on Dawood Ibrahim's sister. Dawood has 12 siblings and Haseena was the seventh one, who died in 2014 due to a heart attack. The film will portray her life's 40 years and will show what it is like to be a don's sister. "Shraddha will be given a lot of prosthetics to make her look convincing as a woman of 50 and 60. She sees this role as a big challenge as it is her first grey character. Her father has played antagonists all his life, and yes, she would be seeking Shakti Kapoor's inputs to play Haseena Parkar," the source added. Meanwhile, Shraddha has garnered appreciation from all quarters for her brilliant performance in "Baaghi" opposite Tiger Shroff. The actress will be seen in Tiger's upcoming film "A Flying Jatt" as well. However, she will make a cameo appearance in the Remo D'Souza directorial. The "Ek Villain" actress has also signed films like "Rock On!! 2," "Ok Jaanu" and "Half Girlfriend." She will be seen sharing screen space with Farhan Akhtar, Arjun Rampal and Prachi Desai in "Rock On!! 2." In "Half Girlfriend," the actress will star opposite Arjun Kapoor, while in "Ok Jaanu," she will be seen romancing Aditya Roy Kapur. "Ok Jaanu" is the remake of Mani Ratnam's Tamil film "OK Kanmani," which starred Dulquer Salmaan and Nithya Menen. The actor takes on the role of Ibrahim Parkar in the Haseena Parkar biopic. After playing husband to Aishwarya Rai Bachchan's Dalbir Kaur in Omung Kumar's Sarabjit biopic, Ankur Bhatia takes on the role of Ibrahim Parkar, Haseena Parkar's better half in Apoorva Lakhia's film on Dawood Ibrahim's late sister.Shooting for the film starts in November. "Haseena married Ibrahim at the age of 17 and was smitten by his strong, brooding personality. He was a Pathan running a vegetarian restaurant in a Muslimdominated area. A majority of his customers were Maharashtrian mill workers who used to work nearby.He had no underworld connections and was killed by Dawood's rival gang, as he went about his business at his eatery," says Ankur who first met Apoorva at a film festival in New York where the director's Shootout at Lokhandwala was screened. "We kept in touch. He appreciated my work in Sarbjit. I am excited and looking forward to work with him," adds the young actor, who has begun prep for the film, with Apoorva. "He has researched a lot and has given me several pictures of Ibrahim, who was passionate about Hindi films and had worked as a stuntman too. His dressing sense was somewhat inspired by Bollywood too," Ankur adds, further revealing that he hasn't met Shraddha yet but is looking forward to work with her. "Shraddha is immensely talented. All of us will have a joint reading session once the entire cast is locked," he adds. While speaking to Mirror (June 10) Siddhanth Kapoor who plays Dawood, had revealed, "Both Dawood and Haseena will age over a span of two-three decades in the film."